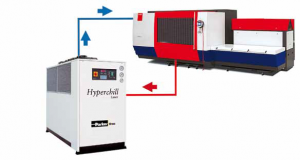 The standard models are augmented by a wide range of options and accessories, which together ensure Hyperchill is the perfect solution to each and every industrial application. Hyperchill maximizes productivity and minimizes costs, as well as easing conformity to regulations on water quality. 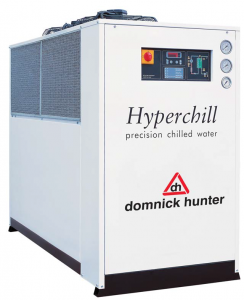 Hyperchill is the perfect solution to industrial chilled water needs. The use of cold water is very common in industry. The motives are obvious: cold water improves productivity, secures industrial processes and reduces costs. There are several methods of creating cold water, but water chillers are increasingly becoming the preferred solution. But why? Firstly, chillers always supply the exact water temperature requested, even with differing ambient conditions and differing load requests, thus ensuring optimum efficiency. Water has furthermore become a very precious, and costly, natural resource. Chillers, by operating in a closed circuit, continuously reutilize the same water, and thereby avoid unwanted water wastage. Add to this fact that a number of directives have recently emerged to safeguard both the quality of the water being utilized (for health reasons) as well as the discharging of impure water into the ambient (to protect the environment): closed circuit chiller operation greatly simplifies conformance to these regulations. The needs of industry are changing, and a water chiller increasingly satisfies these needs.